I am sure by now it is not hard to guess what the team at POPCUlture Online is busy with. The coolest event is back in town and we are proud and honored to be one of the supporting media for this year’s STGCC again. The Singapore Toy, Game, Comics Convention is always an important event for POPCulturer Online as it is here that the idea embark on this adventure begin over two soft drinks in a small quite corner of a fast food place. Yup it was a humble beginning that has transformed over the years to an mega adventure for everyone here. This year’s STGCC looks to be another exciting one with so many big names from both east and west popular culture realms coming together in the little red dot called Singapore. The team had quite a lot of fun at the media preview and adding to my collection of photos, I got a chance to take a shot with the two lovely ladies, AZA and Vampy Bit Me. Of course the real problem now is trying to find a space for the huge Metroplex that I have been dreaming about since I was a little transformers fan. Anime fans will be happy too that acclaimed designer and artist Redjuice whose works include the highly popular Guilty Crown will be in town and we see that Vampy is gonna cosplay something from there. I’m still thinking if I wanna get one of his artbooks for my office desk but that’s another story. Well I gotta go and continue planning for this year’s coverage as my dear Editor will be involved in something else this year. But don’t worry, he will still be around at STGCC. In fact, it will be quite hard to miss him… or at least his voice! 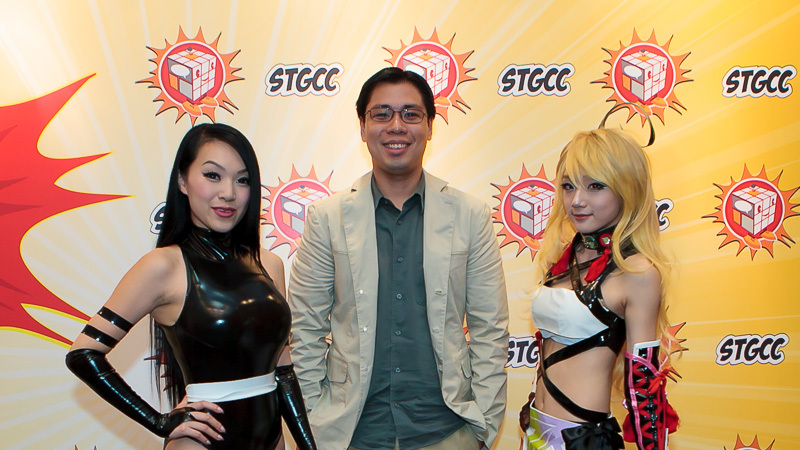 The POPCulture Online team is all excited for this year’s STGCC and we hope you, our readers are too. Do say hi if you happen to see us and remember to check back here after the event as we will continue to do our best to bring you our coverage of the coolest event to hit town this year.